BMW’S Retro Racer is a revelation. Jeremy Webb rode the R Nine T Racer S and was in raptures. On a trip along the South coast, he beamed on the BMW. When it comes to heritage, few motorcycle companies have more than BMW. I got to sample some of this when riding the R Nine T Racer S, a retro bike which is totally modern. It has the looks of a 1970s Racer and certainly handles like one. 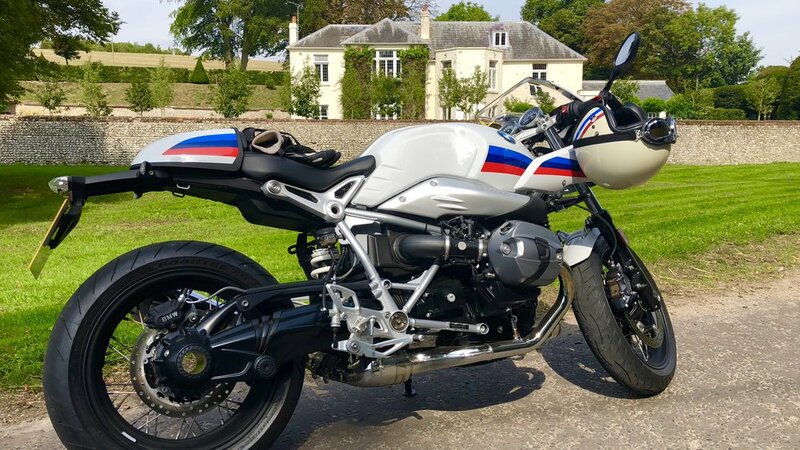 BMW, however, have taken their heritage and brought it totally up to date, with all the tech you could want on this type of bike. You are not going to buy a Racer for long trips into Europe. The R Nine T is a single seater with no room for panniers and a true racing riding position. Leaned forward with head either tucked down behind the race fairing or lifted slightly for more vision. This is fine for an hour or so, but not great for extended hours in the saddle. You buy this for pure pleasure, and as BMW says to Make Life a ride. I WANTED TO RIDE THIS EVERY DAY, it was that much fun. I could ride it sensibly and plod along acknowledging pedestrians staring at the bike, or I could ride it like it is intended to be. Hard and fast. Blasting along tucked down with a huge smile on my face. I did this most of the time. The dynamically designed half-fairing improves riding experience, especially at speeds of over 60mph. I didn’t have a problem with the riding position on the journeys I made. They were all under ninety minutes, so no numb bum or aching back. This may have been a result of the adrenaline produced. The bike is light, nimble and fast. Handling is sharp and improves the faster you ride when aerodynamics kick in and it adopts its true racing pedigree. This is a bike you could enjoy track days on and then ride home very easily. The bike will do about 45mpg so the range is approx 150 miles which does equate to about ninety minutes of riding. As I mentioned this would be about the length of time where the riding position would become uncomfortable and call for a stop to stretch. BMW see this as a base bike for owners to then put their own identity on, with hundreds of custom parts available and many firms making after parts for it. I love the look of the bike as it, with twin round clock-like displays, stretched tank and comfortable single seat. I like the wire wheels and BMW striped colour scheme, which is clean. It has a 2-in-1 exhaust in the typical café racer design style, showing that the technology does not have to hide away, either. The handlebars are positioned low on the upper fork bridge. The moderate offset protects the wrists. The footrests, on the other hand, have made their way backward and upwards to support the sporty seating position. In addition, the optional custom rider's seat lowers the seat height from 805 mm to 795 mm. 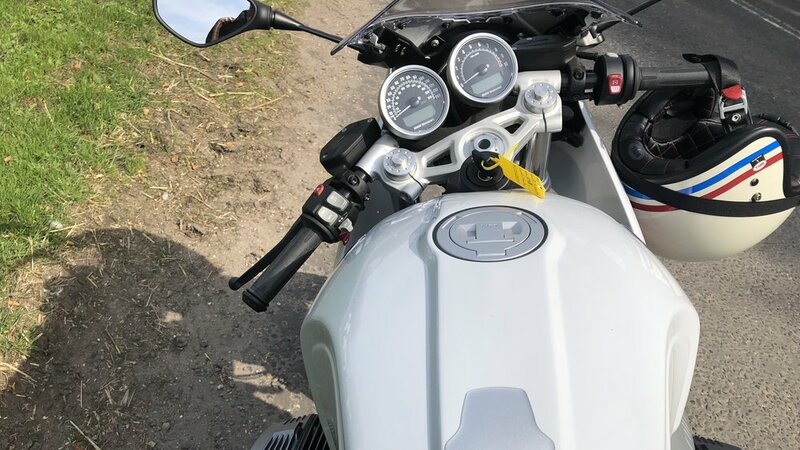 The cushion on the rider's seat is slightly raised at the rear. This ensures perceptible relief for the back on long rides. This bike is pure fun and I would love to own one as a second bike for weekends and journeys that have no purpose but for pleasure. Bikers will relate to this. It is not a commuter bike or workhorse. It is priced at £11,730 in the S variant. Thanks to the staff at Vines BMW Bikes, Guildford for providing the bike. Engine: Air/oil-cooled, four-stroke twin-cylinder boxer engine, four radial valves per cylinder, double overhead camshaft, central balance shaft.